50, 60, 70 lbs. 25" - 30" 7.75"
How To Choose Arrows 314 FPS 75% 33" / 4.3 lbs. Welcome to our PSE Stinger 3G review. 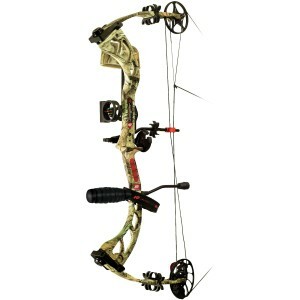 The 3G is an upgrade for PSE Stinger that used to be one of the most popular compound bows (CB) ever made. It is a great beginner’s bow for learning archery and hunting. The build and weight of the bow are suitable for people getting into compound bows. Being one of the cheapest PSE compounds on the market, the Stinger 3G comes with a noise and shock suppressing string stop, firm riser, and a quality peep sight. The draw length is between 25’’ – 30’’. It comes with a stabilizer, quiver and a neoprene sling for a stock product, which is a great deal for a beginner. This is overall a really well-designed package with some high-quality accessories that will get any beginner started out on the right track. The built-in cam is a HP Single Cam with Posi-Lock inner cam. This allows for making draw length adjustments without using a bow press or any external modules – all you need is an Allen wrench. Also, full draw length adjustments can be made without changing the inner cam. The draw length adjustment is 5’’, between 25’’ and 30’’ in half inch increments. By having a parallel limb design, the bow has good shock resistance and faster release compared to pre-loaded limbs. In the end, the string suppression system makes the Stinger 3G noiseless and more stable, regardless of whether you go for the 50, 60 or 60 lbs. draw weight version. The lower the draw weight, the shorter the draw length and/or the heavier the arrow, the lower the FPS of your bow will be. Learn more about what speeds to expect from your bow depending on its settings. Note: the values above assuming you’re shooting at a target located at point-blank range. For an actually useful number, subtract 1.8 ft-lbs from the KE values above for every 10 yards traveled by the arrow. So if shooting at a target located 30 yards away, subtract 5.4 ft-lbs from the values above to determine the actual KE your arrow will carry once it impacts your target. Learn more about kinetic energy for a better understanding of the numbers above. The draw is comfortable and easy with a great maneuverability in the draw length. The 5’’ range is great for beginners who are unfamiliar with CB. If you hear any noise or clicking while approaching the full draw cycle, grease the cams slightly to ease the rigidity. Once this is sorted, the draw is smooth and can last for over 3 months without waxing/greasing. The valley is smooth and stable at full draw. It is comparatively the smoothest CB for the price range in the market, and the valley is comfortable and wide enough to accommodate beginners still working on their form. The back wall is very stable as well, and there are no noticeable humps during the draw phase of the cycle. The PSE Stinger 3G comes with a built-in noise suppression system with an integrated string stop. Apart from the ‘twang!’ during release, the bow is quiet and doesn’t vibrate during the shot. Though the VibraCheck system reduces vibration significantly, it is not entirely free from vibrations. Third party systems such as a wrist strap can be installed remedy this. Cable slides: Though the default slides are good, you can always replace them for something a little better if you’d like for the draw to be even smoother. Parallel limbs: As discussed earlier, parallel limbs provide better hand-shock resistance upon release. The bow is 33’’ from axle to axle, and the limbs are connected together with a rigid cam system with a 7.75″ brace height. VibraCheck limb bands come pre-installed on the bow and help absorb residual energy from the limbs when shooting. After finishing the shot, the bow is at zero vibration and does not sway from side to side. Pivoting limb pockets secure the limbs firmly in place, although you can feel a slight ‘sting’ of vibration after finishing the shot. A glove can be used if you hate the metallic feel after shooting. I buying a glove as it will make your shooting experience more comfortable in the long run. Having a 33″ AtA length, and being light-weight (4.3 lbs), the Stinger 3G is an ideal hunting bow for beginners. The flexibility and maneuverability is that of a classic hunting bow, while at the same time having the technology and mechanisms needed for 21st century shooting. The only hassle is for taller hunters (more than 6.2 feet), for whom the 30″ maximum draw length might not be enough. The Flexxtech stabilizer and Gemini Sight are very valuable additions while in the field. The bow has a parallel limb design that absorbs shock and increases stability as discussed earlier. The PSE Stinger 3G has an X-Force-inspired riser made of machined aluminum. The grip has a beautiful convex curve and is ergonomic regardless of your bow hand (I am a southpaw) and provides for a very stable grip. The metal is laminated with comfortable holding dents which have not faded since the time of purchase. The PSE Stinger 3G is one of the least expensive and perfect CBs for beginners. They last for decades without failure, and do not wear out after extensive use. Writing this review after six months of purchase, the bow still feels new and has the lusty metallic odor that oozes the passion for hunting and shooting every time I grab this weapon. Definitely a very solid purchase for any beginner adult. Thank you for reading our PSE Stinger 3G review. This is one of the best starting CBs and comes with a set of brilliant accessories that make the bow capable of withstanding the test of time. The tuning marks and flexible parallel limbs add an aura of complexity, which takes time to master as you keep hunting. Don’t forget to get the Ready-To-Shoot edition, as it is fairly priced for the add-ons that you would otherwise need to purchase separately. See Cabela's current price and customer reviews on the Stinger 3G.